This is my FIRST MyGlam bag and granted these are my initial impressions (haven’t had time to USE any of the products yet) but overall I’m very pleased! Each month for $10 you get a custom made makeup bag (so each month the bag itself is different) and a selection of beauty products. I am REALLY happy to see that the majority of the products are full-sized. The only thing that isn’t full size is the Wen Cleansing Conditioner but even then I think 2oz is a really decent size. You also get coupon codes for EACH product ranging from a special kits to a percentage off your order with those companies. I also LOVE the bag, I think it’s really cute, a good size, and I love anything and everything that has a nature inspired design on it. 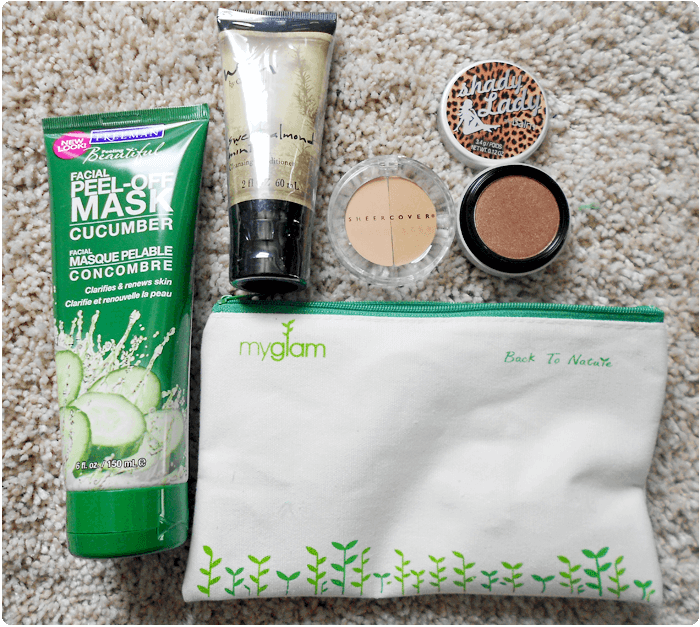 Overall the only products I’m a bit iffy about are the concealer and facial mask. I’m very picky when it comes to facial care and worry that the mask isn’t a good fit for my super dry occasionally sensitive skin. When it comes to the concealer, I believe it’s a mineral based brand? So I may try that on my dark circles, see how it goes. Do you have any experience with any of these products or with MyGlam? By all means, share! I use Sheer Cover concealer and powder and I love it. If there’s a better concealer out there, by all means fill me in because dark undereye circles a huge problem for me. ok, excited then because I have awful deep dark circles! LOL!!! I’m excited about February’s bag already because… I’m hoping it’ll be pink LOL! They mail them out on the 10th of the month! A lot of people doesn’t seem too happy with the January bags compared to the December’s because the products weren’t as great. However, I think it’s pretty good. I mean, for $10, you’re getting way more products that is worth the money. I haven’t heard of some of those brands in January’s bag, but I am excited to check them out as soon as mine comes. I saw via their website what was in December’s bag and I have to say, I think this bag was much better because the products are all full size except the Wen and even then, it’s a really good trial size (far bigger than a “deluxe sample”.